Tamar Chain Bridge | Launceston Then! 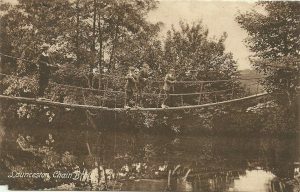 Just a short walk down from Dunheved Bridge where the A30 crosses into Cornwall over the River Tamar, there was once the Chain Bridge. It enabled the walker to cross from the Lifton side to Lawhitton side of the Tamar, and was a popular spot due to its close vicinity to several deep pools which permitted the casual swimmer. Many a picnic would be held down there. 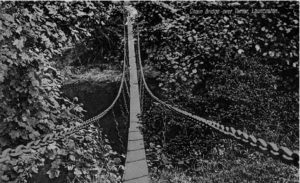 The Bridge was constructed of chains slung across the river and separate slats of wood fastened to the main linkage with shorter chains, all of which were anchored by large stone bases. During flooding all kinds of debris would entangle itself around the construction and it was one such flood that eventually destroyed the bridge. 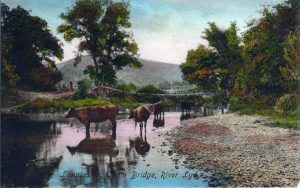 Today the only evidence that the bridge existed are from the stone foundations. 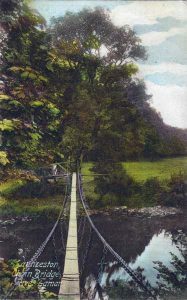 Tamar Chain Bridge in 1916.